The article features Pamir in quartz Jewel Glass and mirror. 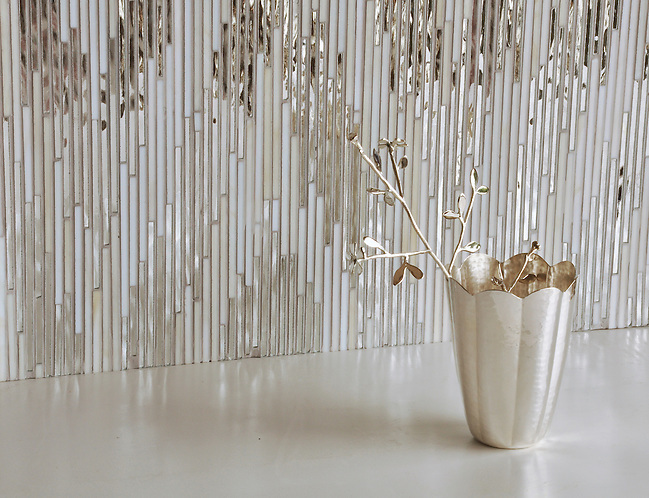 New Ravenna Mosaics uses jewel glass and marble in its “Pamir” collection to create elegant texture and sinuous movement in custom mosaics for floors and walls. The warmth of hand-crafted mosaics in palettes of Winter White are classic and contemporary interpretations of myth and landscape. Central Asian Ikat textiles, silk ribbons, ancient Greek nudes and florals inspired by the Silk Road Collection all captivate the imagination. Tile Magazine at www.tilemagonline.com is a great source for everything tile: Including how to maintain your tile, membrane guides, and of course lots of lovely artisan, mosaics and tile introductions!